Lakeside Marine Canvas, located in Buford, GA — north of Atlanta on Lake Lanier — is one of the “top-tier” Marine Canvas shops in Georgia. Owners Daymon and Joni Johnstone have built a 25+ year reputation on quality marine canvas solutions. They are not the “low price” shop, but are fair and stand by their product — the customer doesn’t pay a single penny until satisfied with the completed job. 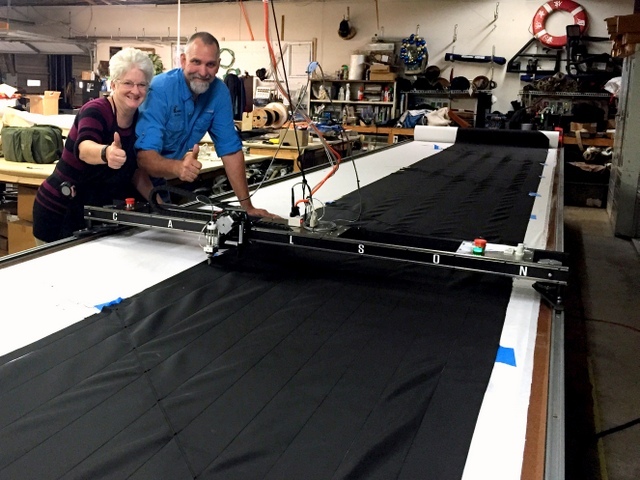 Joni and Daymon give a “Thumbs Up” next to their NEW Carlson Design PT-72″ Plotter/Cutter with Hot Knife tool attachment. 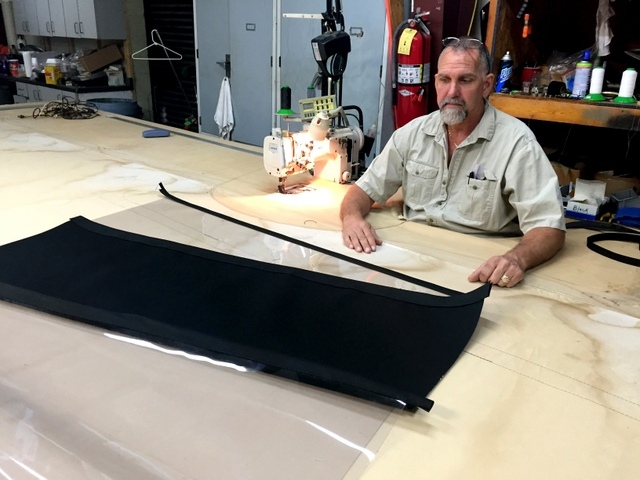 25 years ago Daymon made the decision to leave construction work for marine canvas. He said, “I knew I couldn’t swing a hammer forever, but I bet I could sew when I’m old.” 25 years later, despite still loving being behind one of his long-arm sewing machines, he’s decided they need a retirement/succession plan. 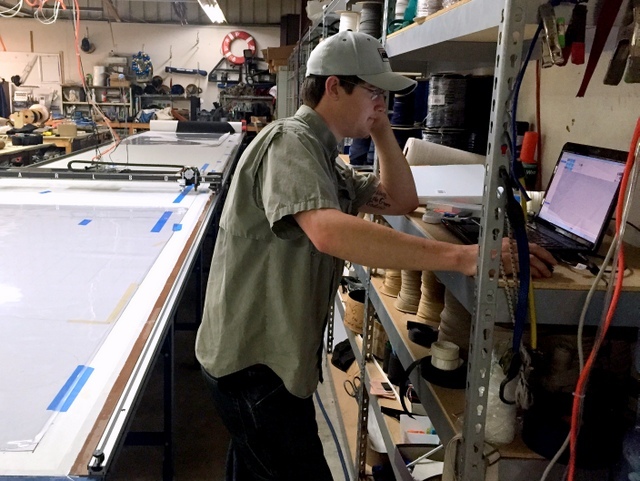 To help grow the business and make it viable for the next generation — their son Brik and his best-friend Billy — they purchased the Carlson Design Plotter/Cutter and Laser Products 3D Digitizer . By creating a digital system for producing their best-in-class covers and enclosures they can begin to extract 25 years of canvas knowledge from Daymon’s head. Daymon and Billy “un-fold” their first enclosure in Rhino/Mpanel. Daymon knows canvas and Billy knows computers. 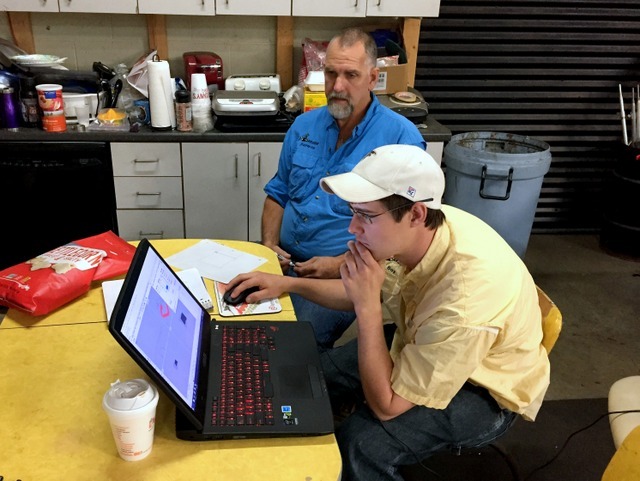 But, neither have any CAD experience, but together they are designing their first house-boat enclosure on the computer. 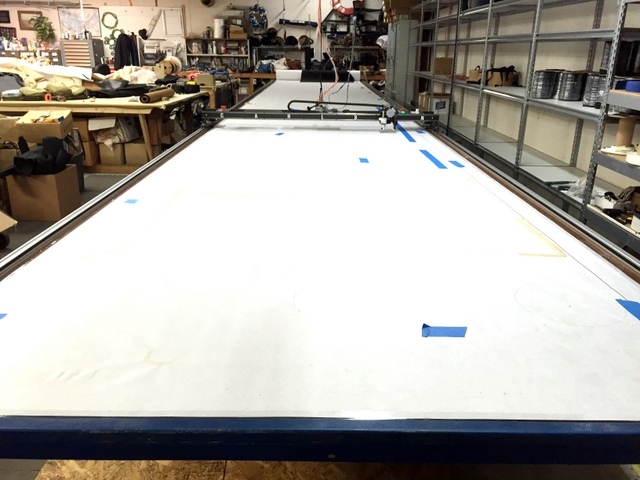 Carlson PT-72″ Plotter/Cutter on a 6’x40′ Phillocraft Vacuum Table. The Carlson Design Hot Knife tool attaches to most Plotter/Cutter systems. Swapping the Hot Knife for the Rotary/Drag blade holder takes just a few minutes. The Hot Knife creates a sealed edge and cuts against a heavyweight paper or sheet-metal cutting surface to prevent burning your table top or plastic cutting surface. 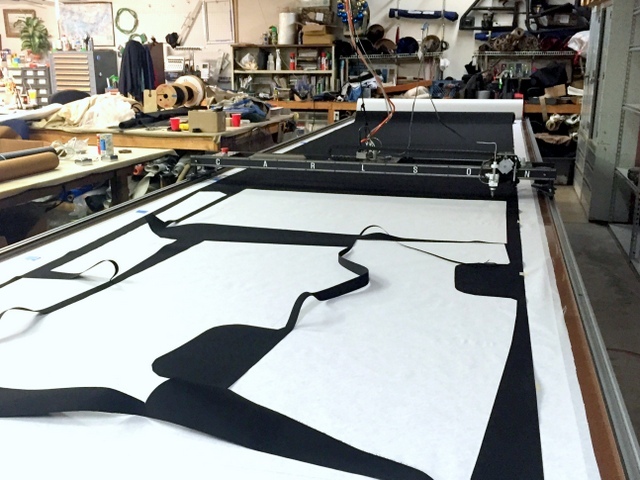 then bring the heavy panels back to the shop to trim, sew and finish. This process can take three or four trips to the boat, with multiple people, each increasing the likely hood of ruing the panel or scratching the Regalite Windows. Their new system allows them to measure in any weather condition, in one trip, with one person, without bringing panels to the boat. Patterns are generated at the computer, and are digitally stored, nested to maximize material savings, and then quickly marked and cut with their Carlson Design Plotter/Cutter. 2nd Job Completed with Plotter/Cutter and Laser Digitzer! All of their Sunbrella, Weathermax, and Top Notch cuts require a sealed edge which is time consuming and “smelly” to do by hand. Especially the top-notch which is hard to cut and smokes continuously. They use Top Notch, cut on the bias, in 4″ strips as a finished edge on many of their enclosures. 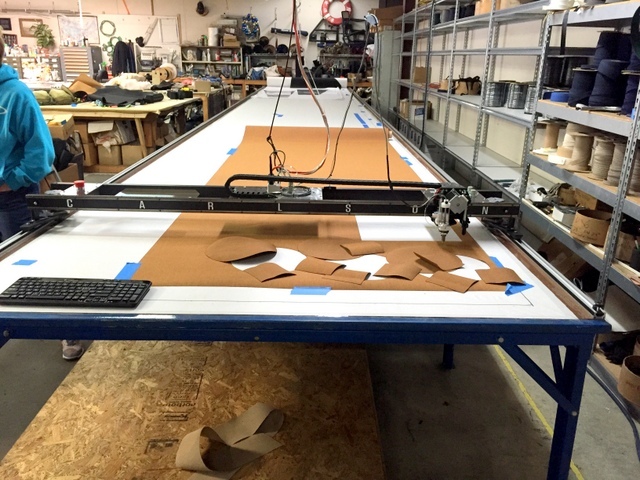 Cutting the perfect 45 degree strip is tedious, so we cut a series of 60″ wide bias strips, sewed them together and used the Plotter/Cutter to hot knife cut 30′ long. 4″ strips. This was cleaner, faster, easier to sew, and smoke-free. The Hot Knife is slow relative to the rotary blade — 2IPS vs 30IPS — but it’s accuracy and consistency make it significantly faster than hand cutting. 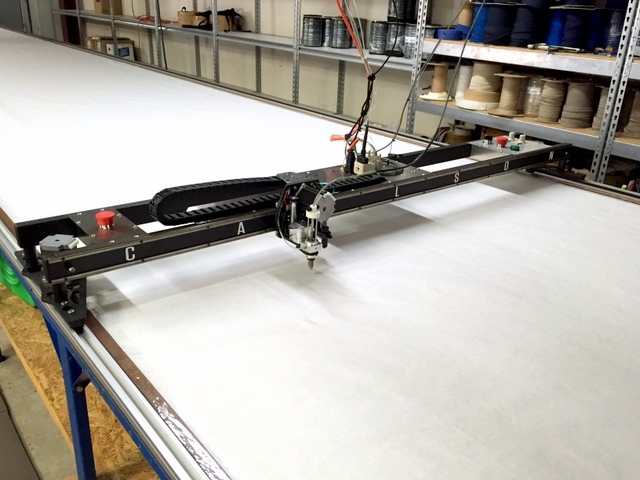 Running the Plotter/Cutter is push-button easy and cutting repeat patterns takes minutes, not hours. Nest and cut motorcycle cover. 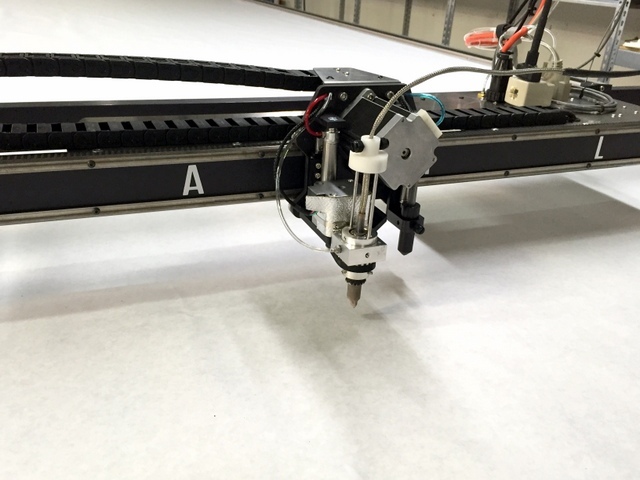 The Carlson Design Plotter/Cutter system provides many advantages over “the old way”. Below we examine the following advantages of our system. 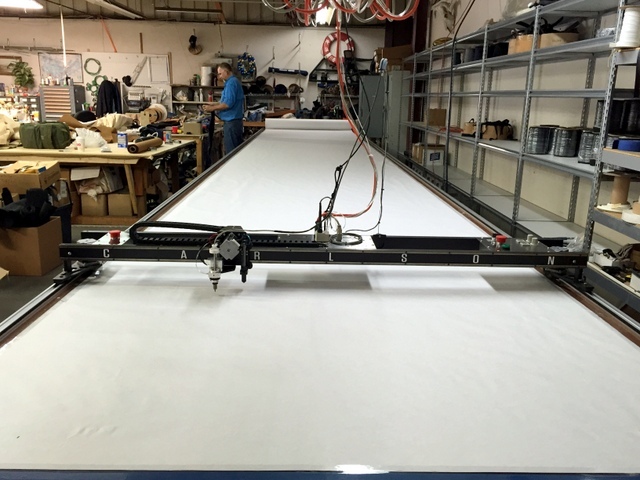 They are creating a simpler system for producing quality canvas. The new system will eventually allow them to take on jobs that Daymon didn’t physically travel to and measure. 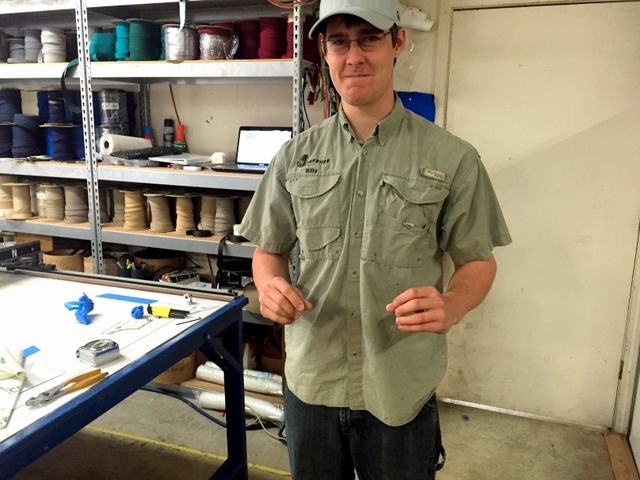 Instead of teaching the next generation to travel, measure, mark, cut, seal, and sew, Daymon can focus on teaching Billy how to use a measuring tool and a plotting/cutting tool that are part of HIS system. 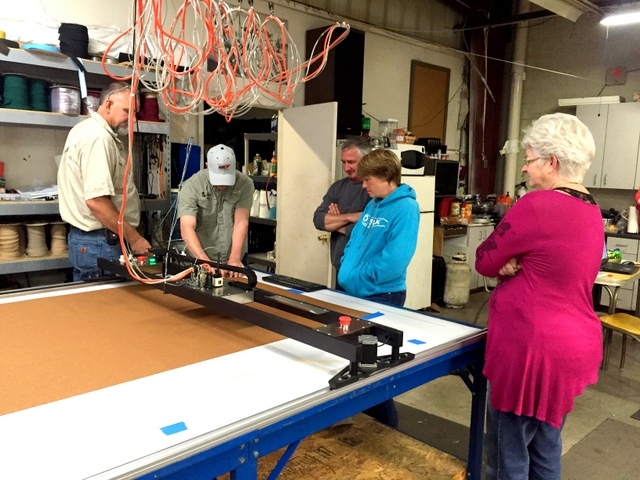 Billy is showing a neighboring canvas shop how to cut with the Plotter/Cutter. He is quickly becoming comfortable with this new tool. Hot Knife cutting perfect patterns now happens with the click of a button, instead of years of practice. They are using a 40lb paper for their Hot Knife cutting surface. The Hot Knife cuts their material, but not the paper. The Paper is a consumable, but can be used for many cuts. As they learn their measuring process they are able to improve product fit and reduce material handling. Their best marketing tool is the finished product on the boat — this means a better fit is a better marketing pitch to for their next sale. Table tops are covered in soft canvas to prevent scratching the Regalite during cutting and sewing. The Carlson Design Plotter/Cutter allows them to cut a wide variety of marine acrylics like Sunbrella, Weathermax, and Top Notch, all with a sealed edge using our Hot Knife tool attachment. They can also quickly switch to the rotary blade holder to score and cut Regalite windows, or the drag blade holder to score Makrolon. The Regalite scratches very easily, so using the Plotter/Cutter not only improves fit, but reduces the opportunity to scratch the panels. **Operator’s note: They score and peel-out their 40ga Regalite panels. 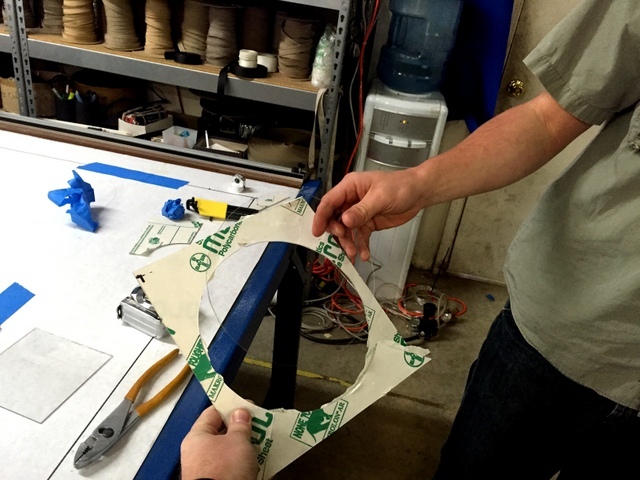 By not cutting through the material they do not need to change from the paper used for the Hot Knife cutting surface. The Plotter/Cutter and Digitizer provide time savings throughout every aspect of the manufacturing process – measuring, marking, cutting, and installing. 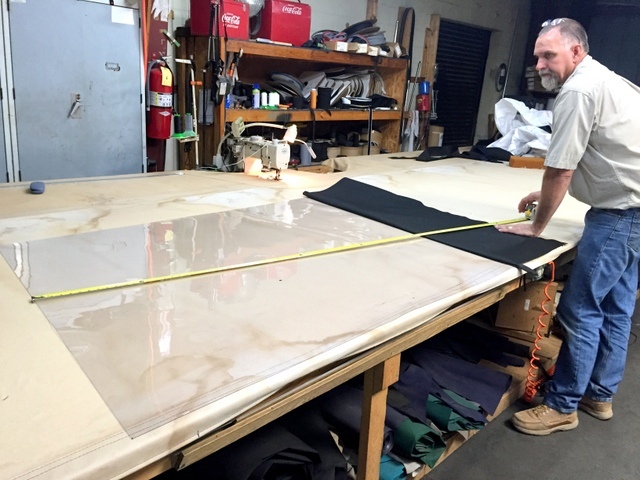 While the initial time to pattern the boat is greater — maybe 30-45 minutes, instead off their current 15 minute “ball park” estimate, they get their biggest time savings by eliminating redundant trips to the marina to fit and re-fit panels. Patterning by hand results in a large amount of material waste. Nesting allows them to layout and inspect all of the parts for a job before the job is ever cut. They can also use the nest to determine the exact amount of fabric to order! Plotmaster makes manually nesting parts to maximize material efficiency easy. Nesting parts allows them to the exact yardage of material to complete an order. This can also help with quoting. 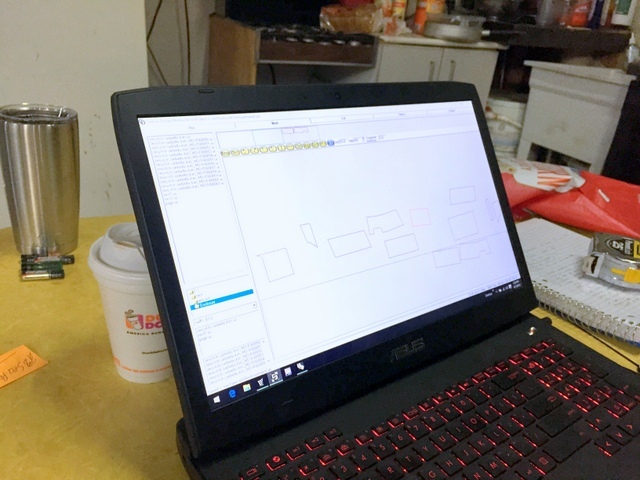 The Plotter/Cutter and digitizing solution help free up the most valuable people in your shop to work on other projects. They spend less time driving to the job site, less time hand marking and cutting patterns, and less time re-cutting patterns for a better fit. This allows you to expand your range, take on bigger projects, and quote larger jobs. Lakeside will be able to start finding new business by quoting OEMs, Boat Dealers, and heading to new Marinas on different lakes. 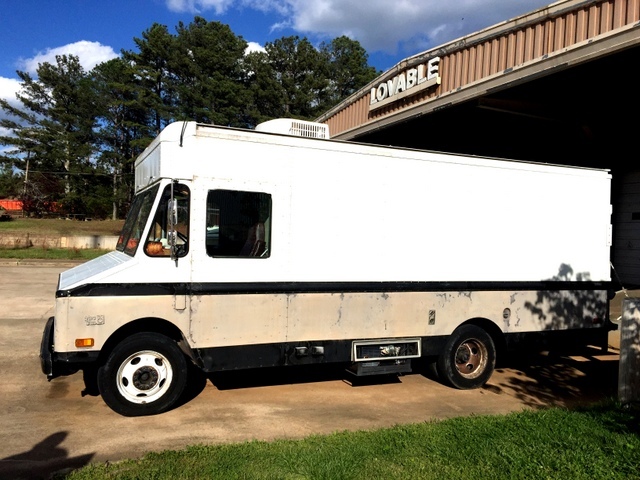 Daymon’s mobile canvas shop has everything he needs to finish a job onsite. In the future, he can leave the truck at home and only bring his Digitizer and cell phone. 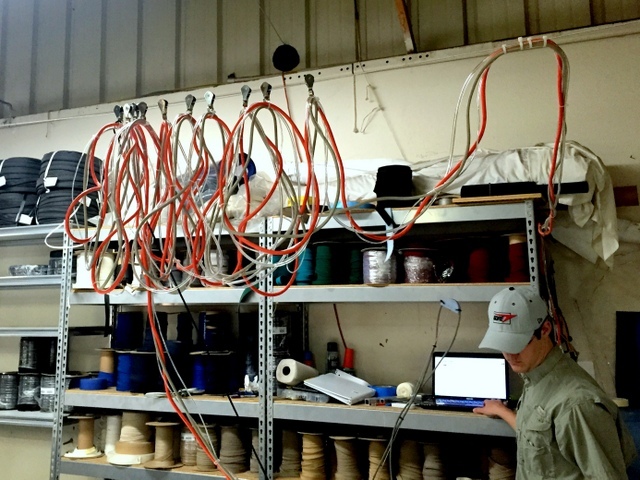 Daymon and Joni are adding a lot of value to their business by building a pattern library. If every year they add one new house boat per week, that’s 52 boats per year. In 10 years they have over 500 boats in their pattern library. Many house boats last for 40-50 years or longer — think how many 1970 boats are still getting re-covered. If you recover a boat every 5-10 years, that’s a VERY valuable pattern library. Future patterns can be cut as simple as spreading material, selecting a file, and hitting “PLOT”. 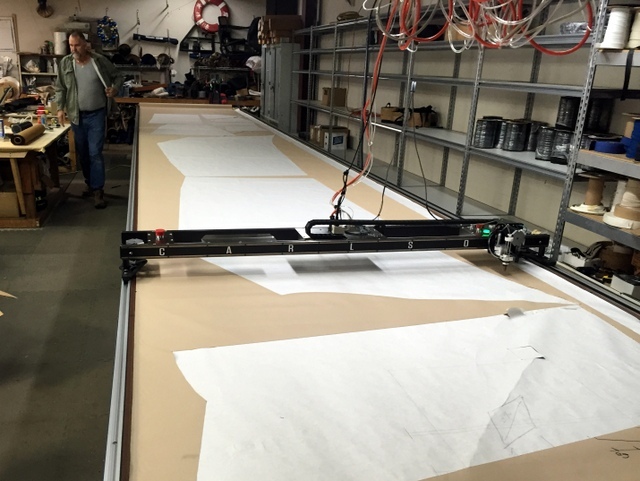 Their Carlson Design PT-72″ Plotter/Cutter includes our universal pen holder, magnetic mount rotary and drag blade holders, and a Hot Knife tool attachment. This means they can mark and cut a wide variety of materials. We even provided a kiss-cut sign-knife to mount in their universal pen holder for cutting large vinyl graphics. Billy was already dreaming about which boats and trucks would be getting a new “racing stripe”. Using the carbide drag blade they can score and “break-out” shapes out of Makrolon. Billy holds up a perfect circle cut out of Makrolon. It’s invisible because it doesn’t have any scratches! 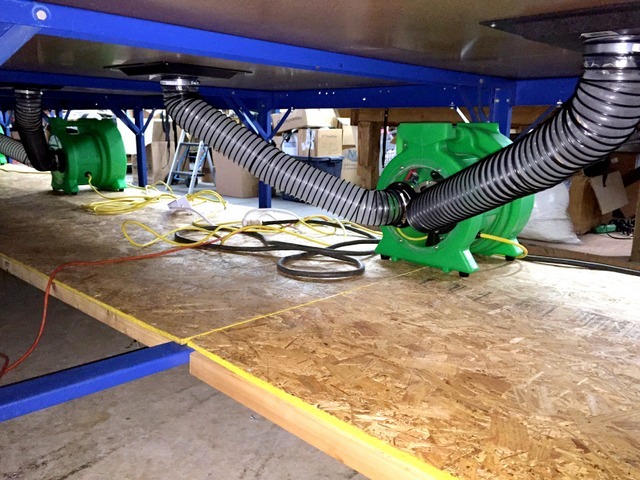 They are securing their material during cutting with four 1.5HP radial vacuum blowers. These plug directly into mains 120VAC and come standard with a wireless on/off switch. 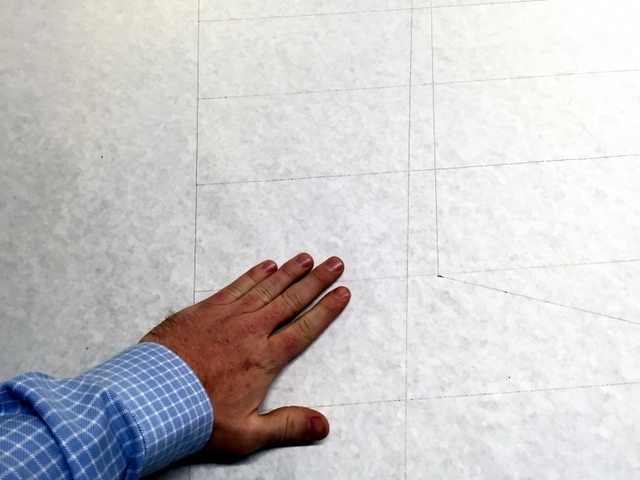 The vacuum is pulled through the paper cutting surface. Simple operator’s workstation. Until they decide their final layout Billy is using a laptop sitting on a nearby shelf to drive their Plotter/Cutter. Once they decide their ideal work flow this will move be moved to a desk or cart. Daymon is 6′ 10″, so we ran their cables high above the table. This is the simplest, most reliable cable management solution — but not the only one. This was a great install. We would like to give a big THANK YOU to Joni, Daymon, and Billy for helping make this a successful setup. We also appreciated the go-carts, buffalo wings, and getting to stay one their house boat! 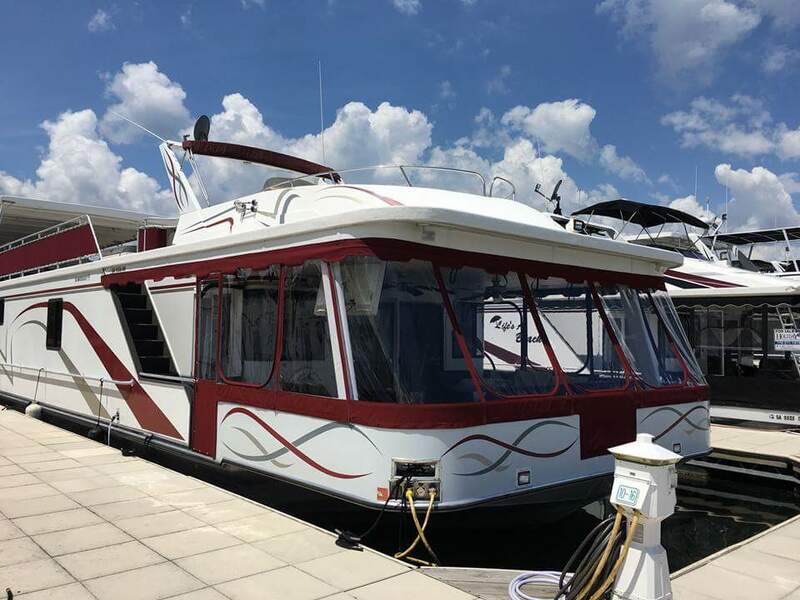 We can’t wait for our next trip to Atlanta, and if you’re in the are you should take the time to visit Lakeside Marine Canvas.